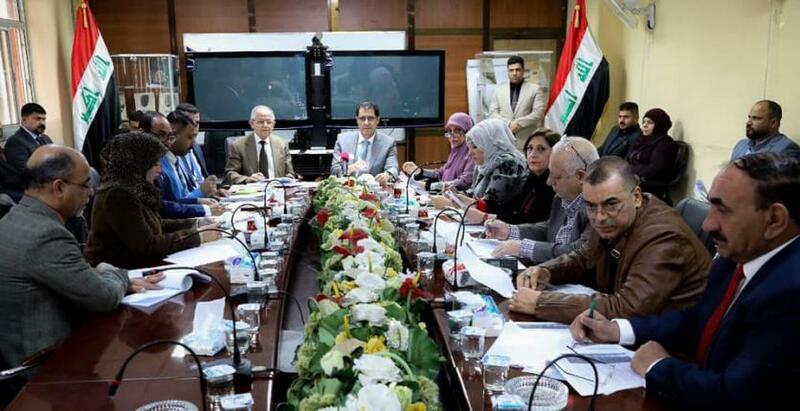 Planning Minister Nuri Sabah al-Dulaimi on Tuesday chaired the 53th meeting of the Contractors Classification Committee, in the presence of a number of representatives of ministries, the Iraqi Engineers Syndicate and the Iraqi Contractors Union. "During the meeting, Dulaimi announced the Ministry's strategic plans to support and enable the contracting sector, within the framework of working to achieve real partnership, within the government's efforts to support the private sector and enable it to play its role as an active development partner for many of the companies," the ministry said in a statement. Economic sectors ". He added that "the ministry allocated 40% to the private sector, of the volume of investments that will be witnessed by Iraq in the coming years, according to the contents of the five-year development plan 2018-2022," stressing "the importance of strengthening the role of the Iraqi contractor, "The minister directed a package of measures aimed at facilitating the work of contractors, guaranteeing their rights and paying their previous dues, pointing out the importance of appreciation of efforts, which continued its work during the financial crisis faced by Iraq." He directed "to conduct a practical review of the laws and regulations regarding the classification of contractors, blacklisting mechanisms and procedures, and in order to achieve the common interests of contracting parties and executing companies, and lead to advanced levels in the quality of projects included in government contracts. Minister of Planning Dr. Nouri Sabah al-Dulaimi chaired the 53rd meeting of the Contractors Classification Committee on Tuesday, in the presence of a number of representatives of ministries, the Iraqi Engineers Syndicate and the Iraqi Contractors Union. the allocation of the ministry , including To 40% of the private sector, of the volume of investments that will be witnessed by Iraq in the coming years, according to the contents of the five-year development plan 2018-2022, stressing the importance of strengthening the role of the Iraqi contractor, and to provide conditions for his work. Which aims to achieve a practical review of the laws and regulations for the classification of contractors, mechanisms and procedures of blacklisting and raising them, and to achieve the common interests of contracting parties and executing companies, and leads to advanced levels in the quality of projects included in government contracts. The minister also directed a package of measures aimed at facilitating the work of contractors, guaranteeing their rights and paying their previous dues, pointing out the importance of assessing the efforts that continued during the financial crisis faced by Iraq.